Dancing goats? Really? Who makes this stuff up? Well, as the legend goes, an Arabian shepherd named Kaldi found his goats dancing joyously around a dark green leafed shrub with bright red cherries in the mountains of Ethiopia. He soon figured out that it was the bright red cherries on the shrub that were causing the peculiar euphoria. Kaldi decided to try the cherries himself, and learned of their powerful effect. As the story goes, the stimulating effect was then shared with the monks at a local monastery, who developed a beverage to stay awake during extended hours of prayer. The drink spread from monastery to monastery, and coffee was born. Coffee spread globally when Dutch traders discovered the coffee farms and began propagating coffee in all of their mountainous provinces near the equator. The French, English, Germans and Spanish quickly followed. These European countries quickly realized that the territories they owned could now produce an important new cash crop. Coffee is the 2nd most highly traded commodity behind oil. Coffee grows throughout the world between the tropics of Capricorn and Cancer at altitudes of up to about 7000 ft. Most coffee plants produce one crop per year, and the coffee "cherries" are picked 3-4 times through the season as they become ripe. One little plant will only produce 2-3 pounds of coffee per harvest. Once picked, the beans are processed using either a wet or dry process, graded, and sent to the designated location for distribution globally. Two main species of coffee are grown, Arabic and Robusta. Arabica constitutes about 3/4ths of the world's production, as it produces a more flavorful bean. However, various grades of coffee define the quality. 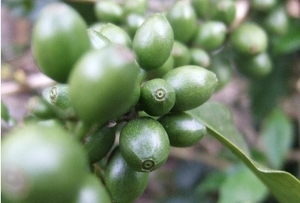 Specialty Grade coffee is the top grade, and only about 10% of the world's production. Within this grade there's still great and so-so. Lizzy's selects coffees from the top 3% of quality of the specialty grade offerings, bringing the ultimate in flavor potential to your cup. The process of roasting coffee is a short 13-16 minute event during which complex physical and chemical changes occur. Growing regions, soil conditions, elevation, milling methods, and storage conditions all affect the chemistry of the bean to be roasted. During roasting, the beans are taken through a methodical evolution that involves 1-2 "cracking" stages, and bean color changes from green to yellow to cinnamon to brown, & finally the desired roast degree the roast master is targeting. Heat and air are monitored and adjusted to ensure that the development of the coffee stays on track. Every origin behaves differently, so no two coffees will ever roast the same. The same bean will even taste different depending on the degree of roast, whether lighter or darker. This is what makes coffee so fun to try! The ultimate flavor you experience is a direct reflection of the roaster's style, starting with the selection of green coffees, and ending with the final roasted coffee. Coffee contains powerful and healthful antioxidants - move over blueberries! Caffeine increases mental performance, alertness and concentration levels. Just think, next you'll conquer the world! Has been shown to reduce the risk of Parkinson's, diabetes, colon cancer, and cardiovascular disease. That just rocks. Decreases impotence in diabetic mice? Yes, that's the study. Coffee has also been shown to improve endurance performance in long-duration physical activities. Go!